Grant, we pray, almighty God, that we may so follow the teaching and example of the Bishop Saint Peter Damian, that, putting nothing before Christ and always ardent in the service of your Church, we may be led to the joys of eternal light. Through our Lord Jesus Christ, your Son, who lives and reigns with you in the unity of the Holy Spirit, one God, for ever and ever. St. Peter Damian, a man of vehemence in all his actions who was brought up in the hard school of poverty, found that he had the vocation of a reformer. He exercised it in the first place against himself as one of the hermits of Fontavellana in about 1035, but he did not remain for long hidden in his cell: his colleagues soon made him their abbot (1043). 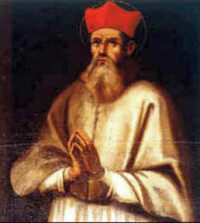 In 1057, Stephen IX made him Cardinal Bishop of Ostia. By his preaching and writings he was one of the valuable collaborators of the eleventh century popes in their great work of reform. Pope Leo XII declared him a Doctor of the Church in 1823. His feast is celebrated on February 23 according to the Extraordinary Form of the Roman Rite. St. Peter Damian must be numbered among the greatest of the Church's reformers in the Middle Ages, yes, even among the truly extraordinary persons of all times. In Damian the scholar, men admire wealth of wisdom: in Damian the preacher of God's word, apostolic zeal; in Damian the monk, austerity and self-denial; in Damian the priest, piety and zeal for souls; in Damian the cardinal, loyalty and submission to the Holy See together with generous enthusiasm and devotion for the good of Mother Church. He was a personal friend of Pope Gregory VII. He died in 1072 at the age of 65. On one occasion he wrote to a young nephew, "If I may speak figuratively, drive out the roaring beasts from your domain; do not cease from protecting yourself daily by receiving the Flesh and Blood of the Lord. Let your secret foe see your lips reddened with the Blood of Christ. He will shudder, cower back, and flee to his dark, dank retreat." In his poem, the Divine Comedy, Dante places Damian in the "seventh heaven." That was his place for holy people who loved to think about or contemplate God. Symbols: Cardinal bearing a discipline in his hand; pilgrim holding a papal Bull, to signify his many legations. St. Peter Damian was a great reformer, often prescribing penances and fasting to lax religious. Choose a day every week, most appropriately Friday, on which you will fast and offer penances for specific intentions. Pray especially that our nation and the world will recognize the evil of homosexuality. Pray for those who are guilty of this sin. Read more about St. Peter Damian at EWTN. Pray the Little Office of the Blessed Virgin Mary, St. Peter Damian revised and recommended it. Go to The Mary Page for a copy. Today's Station is at St. Mary Major. The spring Ember Week consecrated the new season to God and by prayer and fasting sought to obtain abundant graces for those who on Saturday were to receive Holy Orders. The Station was fittingly held in the church, which witnessed the first scrutinies for the coming ordinations, and which was dedicated to the mother of the great High Priest.